My life changed in 1997. And then went out and bought my own copy. I went on to read many things Richard Foster has written. He speaks to me. He sparked something inside that resonated within my spirit. From Richard Foster was a natural flow into reading Dallas Willard’s Spirit of the Disciplines. Soon I found myself attending The Renovare Institute for Spiritual Formation. And I found the people I wanted to be like. People striving to know God more fully. People willing to learn and to practice new/old ways to experience God. Discipline is a bad word in our world. It hints of punishment, of sacrifice, and something we “should” do, but really hate the idea of starting. What would it look like to see the word “discipline” as a good word, something positive and life giving? Perhaps Spiritual Practices is more palatable. But the sense of the word is the same: discipline, in general, helps us to move forward, to grow and mature. Discipline, specifically in a spiritual sense, helps us to know God more fully. [pullquote width=”300″ float=”left”]The idols of pleasure, accomplishment, power, and food are potent. They obscure my view of God. [/pullquote]I need and desire discipline in my life. Not because I can gain or earn anything more from God. I know He is crazy about me- He says I’m the apple of His eye. I know that I am securely held in the palms of His hands by the grace He has given to me through salvation. What more can a girl ask for? So why do I need to practice the Spiritual Disciplines? Because my flesh is weak. My tongue can quickly bypass my sense of discernment. My eyes see flashy things. My appetite is never satisfied. What I’ve learned about the disciplines is this: They help me smash the idols that keep popping up in my life. The idols of pleasure, accomplishment, power, and food are potent. They obscure my view of God. I’ve been a Christian a long time… my heart of stone has been replaced by a heart of flesh. I have a new Spirit residing in me that helps me discern good from evil. Yet I am still susceptible to Idol worship. Paul’s encouragement can only be accomplished by practice, practice, and more practice. You can’t win, much less even run, a marathon unless you train yourself. But we do this in the Christian life. We assume that it’s easy and we can just sit back without any effort to learn and to mature. We think our spiritual maturity will occur by osmosis. However, in reality, our lack of effort results in frustration with ourselves and this life we desire, but can’t quite realize. Our goal is knowing Christ more fully and, as a result, becoming more like Him. So we train one step at a time. It’s not easy. Discipline is hard work from the moment you decide to start to the place where you decide to continue. The Spiritual Disciplines are our tools helping us attain this goal, and honestly, be patient with yourself because it takes a lifetime. This is our hope and cause for celebration. If you want to know more about the Spiritual Disciplines, begin with reading one or both of the books I’ve mentioned above. Seek out others who are like minded and will journey along with you. Sometimes it is helpful to speak with a Spiritual Director who will come alongside you as you follow this path of becoming more like Christ. Recognizing and smashing idols….truly worth celebrating!! Just the encouragement I needed this morning: from the truth about idols, to the truth about the tools I already have, chiefly Holy Spirit within & confident hope from God, to crush them. Before putting faith in Christ, I was part of a volunteer team at a church I attended in Colorado. This volunteer team also met for study. I was invited to participate in this study, this study was through the book “Celebration of Discipline.” At that same time, a friend had also given me “Through Gates of Splendor.” Imagine a non-believer reading these two books at the same time! The two were instrumental in changing my life, and both are at the top of my all time favorite book list. And Dallas Willard’s book, well, there aren’t enough words. Your commitment to helping others in this realm of disciplines is much needed. I appreciate the reminder of how important the training is as we run toward the ultimate prize. Great reminder about how discipline can be a pleasure with the right heart. I forget that sometimes. “we train one step at a time.” Yeah, but I want it right now! I don’t think I am ever more joyful as when I am in spiritual training. Not the facts and figures and memorizing, as much as the discipline of just sitting in that one step I just took. Thank, Beck, for taking the steps down this road to remind us to stay faithful to the road toward God. 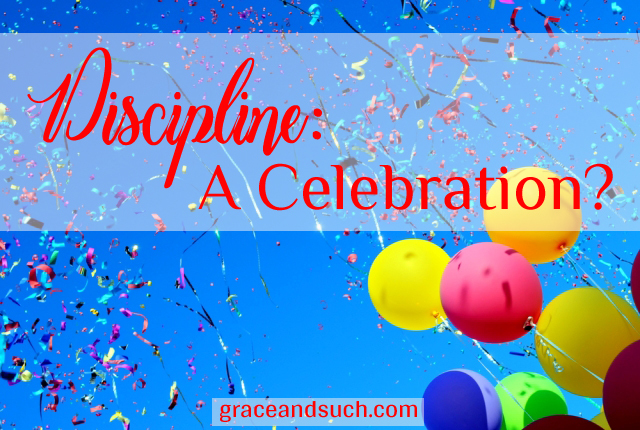 Whenever I’m disciplined in anything it’s a cause for celebration!